The Kamuk Hotel is located in Quepos, Costa Rica, only a stone’s throw from one of the world’s leading tropical destinations, Manuel Antonio. Combining luxury, convenience, and the best location in Costa Rica for exploring, fishing and relaxing, the Kamuk Hotel offers the traveler a variety of exciting things to do. 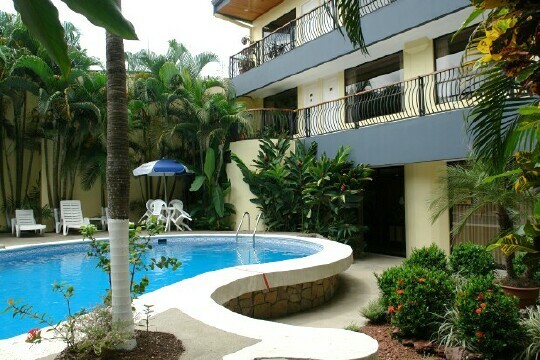 The Kamuk Hotel is the only location in this region of Costa Rica with the characteristics of a top flight hotel; 28 spacious rooms distributed among three floors all of which are equipped with air conditioning, private showers, hot water, telephones and cleaning services. Experience the natural, untouched beauty of the world’s top tropical paradise where the people are friendly and the weather is heavenly. The rooms offer spectacular views and are beautifully decorated. Most have a balcony with an excellent view of the ocean and a cool breeze for warm evenings. 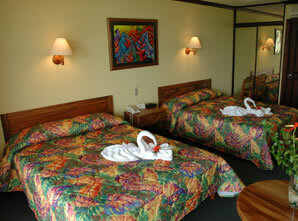 Kamuk Hotel will do its utmost to help you enjoy your visit to Costa Rica. Kamuk helps you organize your tours to different locations around QUEPOS & MANUEL ANTONIO, taking you to different places in the area where you can ride a horse, practise snorkeling, go hiking, or any number of activities that will allow you to enjoy the magnificent beauty that this great country offers. Whether you wish to see the spectacular vistas of QUEPOS & MANUEL ANTONIO, or visit one of the world’s top national parks, Kamuk will surely surprise you. Get yourself to the friendly tour office to plan your next tour in Costa Rica, browse through the gift shop, or take a nice tour of the area, Kamuk will do its best to help you enjoy your vacation in Costa Rica. Kamuk invites you to enjoy the Miraolas Restaurant and Bar, strategically located on the third floor of this magnificent hotel – ideal to witness the majestic sunsets the Pacific Coast has to offer. 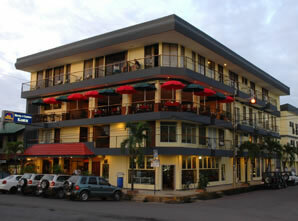 Here you can taste the finest international cuisine and the best in fresh seafood.